When I walked in and viewed my first grade teacher, it confirmed what I had long suspected: that everything on TV was absolutely real. 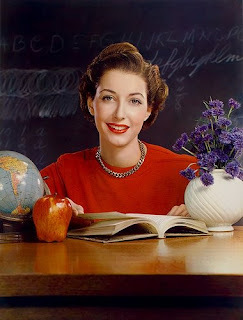 She looked just like the teachers on television: slender, well-dressed, kind, soft spoken and patient. Her name was Mrs. Alexander and she thought I was special. I could just feel it in the way she talked to me. Somehow she managed to make everyone in that classroom feel special. Best of all, because my mom was an excellent seamstress, Mrs. Alexander asked her to do some sewing which meant I got to go to her house in the city she lived in which was 20 miles away. Looking back, I can see her house was just a ranch-style house in a subdivision, but to me it was another scene from television brought to life with beautiful couches, nice rugs and a kitchen that had a counter you could sit at. While I waiting for my mom to take measurements, I got to drink Pepsi. (I didn't know anybody who kept soda in their homes!) She also gave me potato chips--another luxury. Back in the classroom, I was convinced we had a special bond. I even told the other kids I had been in her house which gave me a certain prestige in the first grade classroom for at least a day or two. I paid attention to every word she said in that classroom and left at the end of the year knowing I was smart and capable. I was so lucky to have Mrs. Alexander for my first grade teacher. What I learned about teaching from Mrs. Alexander: Make every student feel special. Mrs. Bowman seemed ancient to me. She was a rather austere woman. What I learned about teaching from Mrs. Bowman: Make the class memorable! you do both things, masterfully.